Please note this post contains affiliate links. To read more about affiliate links, click here. When my district moved to a close reading routine, it seemed like second nature to dig deeply into text with third graders. But, when I moved back to second grade, I’ll admit, I was a little lost as to how I would engage in deep conversations about text when the majority of my students were still learning to read. I knew primary students could engage with text in a meaningful and focused way… but I wasn’t sure how to “create the magic”, so to speak, of close reading with my younger students. Then, I realized, it had nothing to do with the reading level of my students and EVERYTHING to do with the quality and selection of books that I exposed them too. After so much success with close reading with the book, “Crankenstien“, I knew I wanted to recreate the love of a good book just in time for the holidays. After endless searching, I stumbled across the delightful text, “Olive the Other Reindeer” (affiliate link) co-authored by Vivian Walsh and J.Otto Seibold. I was smitten and I just knew my kids would be too! The whimsy story paired with the engaging illustrations made this book the perfect book for a close read! This book had so many literature elements and not to mention a cute and endearing story line! Here’s a peek at some of the activities we did during our study of “Olive, the Other Reindeer”. so funny to hear all the stories and this little conversation peeked my second’s interesting in the book. As we read, I asked students to listen for what our puppy, Olive, accidentally mishears. After we finished our first read, students headed back to their seats to work on some quick comprehension questions. I found this adorable reindeer bucket in the Target Dollar Spot. It was perfect for storing our question cards! We had been working on asking and answering questions, so I knew we were ready to ask each other questions about the story. To do this, I walked around each table with the reindeer bucket and each student selected a question card. Taking turns, they asked their table the question and worked to share their answers. This was a perfect “next step” in creating our own questions for a text. My favorite part of this routine was that even if the students didn’t agree with their answers, they discussed their differences in opinion and moved on. Well done, kiddos, well done! For our second read, I wanted to do something a little more hands on and crafty! After reading through the text, we verbally discussed the main events in the story. Did I mention I have a chatty class this year? I help harness all that gabbing by working in discussions into almost all of our lessons. I’ve found that giving the students time to talk I’m not fighting the talking later. So after our verbal discussion, students headed back to their desks to start sequencing the events on their own. They worked to color the event pictures, then cut them out. After cutting out the pictures, the kiddos had to put the pictures in order and retell the story to me. That was their ticket into turning our sequencing pictures into a fun reindeer hat! Don’t mind my face! This is what happens when you’ve walked around the classroom all morning with reindeer antlers on! LOL! As we read through the text for the third time, we only focused on the sound words that the authors use throughout the text. We didn’t reread the whole book, only the few pages that demonstrated the sound words. We used those pages to launch into a discussion on onomatopoeias and how the author used them in this story. We finally arrived at the conclusion that authors use sound words to help the reader paint a better picture in their brains! YEAH! After reading, we used these sound word cards for a quick game of sound charades. Each student got a card and acted out an event where the noise would be appropriate. Students had to guess the sound that the event would make. My favorite was the “eeek!” card. My cutie pretended to see a mouse and run up on a chair. We may have an actor on my hands! The for our last look at the text, we reread the text, but worked to understand how Olive’s actions effected different events in the story. Before reading, we discussed that characters can react to different events in different ways. I set the objective for our last look at the book by asking students to make note of how Olive reacts during Santa’s delivery of the Christmas toys. After reading, students worked to fill out this graphic organizer noting what happened while Olive was flying with Santa and how Olive helped. If students were unsure of an event or Olive’s reaction, they referred back to the text to help them find an answer. To end our week, we will be completing this responding to text activity and craft. I’m excited to see what my students come up with! I know the little reindeer craft will be a huge hit! Especially since the little antlers on their puppy will be their hands! Too cute! That’s a peek into how we used “Olive, the Other Reindeer” as part of our close reading routine. It was the perfect mix of fun AND learning! Just right for this time of year! 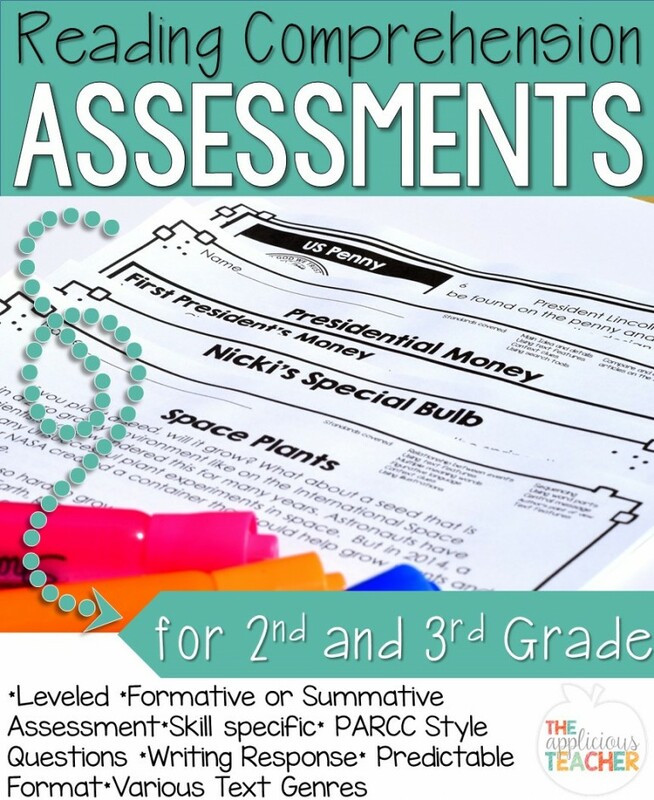 You can snag all of the activities we did AND so much more by checking out this close reading unit in my store. It is part of my “Close Reading All Year” line.